It was a beautiful 24 inch redfish that ate a rusty old Zara Spook just north of Matlacha. We let this one go and I'll catch it next year when it's 26 inches long. Happy 2012 everyone! What do you get when you have a week of falling tides, a nasty cold front, and a ten degree drop in water temps? Lousy fishing! To make matters worse, I was once again booked mostly with fly fishermen this past week and the high winds did nothing to help the situation. I actually had a day where one of my anglers got no bites whatsoever. I mean ZERO. It's happened to me a few times before but as a guide it still really hurts. There were a few bright spots to the week, starting with the beautiful 26 inch red pictured above that local angler Dave Canton caught just an hour before the cold front hit on Tuesday morning. And there was also today at 12 noon, when the tide began flooding in Matlacha Pass and the flats north of Smokehouse Bay turned into an aquarium filled with huge trout and small redfish. It was almost a miraculous sight for my anglers after four hours of looking at empty water, and it got even better when those fish started eating. It was also the first time in four days that I could take off my jacket and feel warm again. The waters will stay cool for a few more days but the end of next week will also bring us some fantastic morning tides. If you want to see some tailing redfish around that time just give me a call. Remember all the doomsday reports about how the BP oil spill would cripple our shoreline for years to come? Once again, the media got it all so very wrong. Read the real story here. If you've been on any flat anywhere in both Matlacha Pass and Pine Island Sound this past week, you've seen lots of redfish. Some of the best low tides of the year happend over Christmas weekend and the tailing conditions for these fish have been outstanding. I've spent most of my time hitting the huge flats north of the Pineland Marina these last three days and that area was covered with reds. Unfortunately, getting them to eat a fly was another story. My anglers this past week were all fly fishing and the dead calm winds made getting within casting distance of these fish a real chore. I could literally pole the boat right over them as long as everyone was standing dead still. Once anyone started to put some fly line in the air, the reds sensed our presence and bolted. I really wanted to bang my head against something out there today. 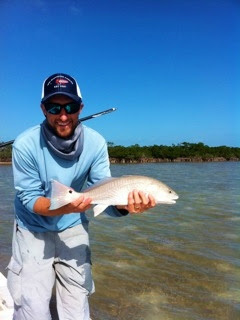 I had some very capable anglers but these reds were even trickier than any Key West bonefish. On the other hand, topwater lures and Gulps still work like magic. I watched a buddy land three nice redfish within twenty minutes on Gulp shrimp while kayaking in Matlacha Pass three days ago. I heard the same story from some other friends fishing closer to St. James City and floating live shrimp near the oyster bars down there. And the redfish in the photos above ate a Zara Spook for local angler Tim Gleason no more than five minutes after we hit the inside of Charlotte Harbor sandbar late last week. So the reds are out there in force right now, but choose your weapons wisely. If you're going to chase them with a fly, be ready to make some long shots and be prepared for some humiliation. If you want to cheat and use Gulps or live bait, be prepared to take home some nice fillets. Florida Sportsman's 2012 series of expos will kick off here in Ft. Myers on the weekend of Feb. 4th and 5th at the Lee County Civic Center. 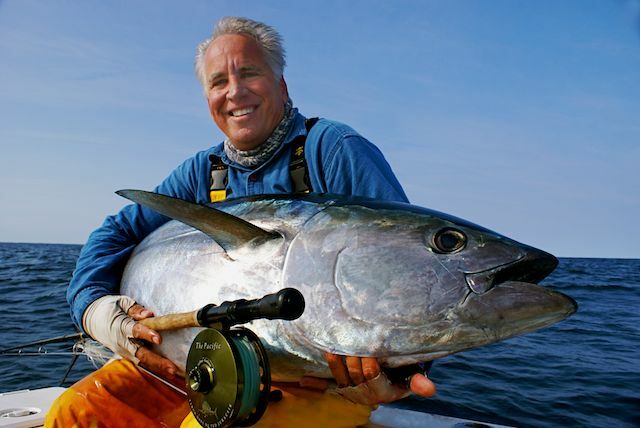 Legendary Keys guide and IGFA Hall of Fame member Stu Apte will be on hand both days doing fly casting demos as well as unveiling his new Beavertail skiff, the BT3 Stu Apte Edition. 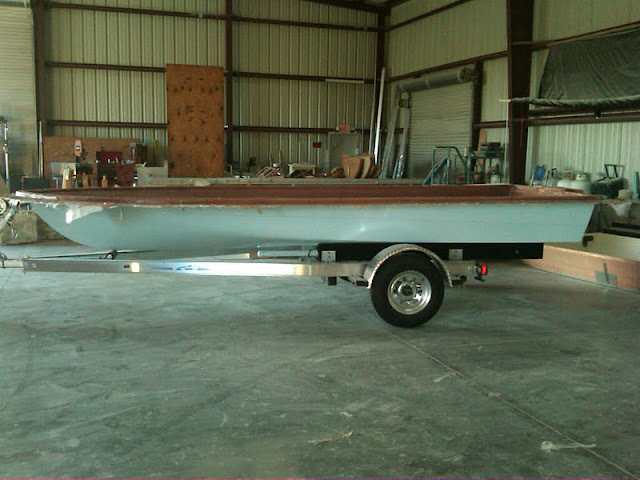 This will be a production boat with a handful of custom features designed by Stu himself that will be available for the first time on a Beavertail. Company owners Will and Elizabeth Leslie will also be bringing two of their Aeon Marine inshore/offshore boats, including their amazing new Aeon 24XP bay boat. I'll also be there on both days with my new BT3 to line up free demo rides in Matlacha after the show. Stop by and say hi to us and check out these great boats. The waters of Pine Island Sound are amazingly clear right now and reds are the perfect target at low tide. The fish pictured above were two of the three we caught yesterday using Marsh Works soft plastics on the flats just south of Cabbage Key. This is a great area to pole and sight cast if you've got a shallow drafting boat. It's also the closest you'll come to Key West style flats fishing outside of Monroe County. The next few mornings will be a bit difficult but next weekend will give us some perfect tailing conditions in the northern part of the Sound. If you asked Santa for some great redfishing you might just get your wish on Christmas morning. How shallow will it float? Here's the answer. To see some other videos of the BT3 running in some rough water click here and here. Two of the best flats guides on Key West are my buddies Capt. Mike Bartlett and Capt. Tony Skinner. Some days I'm convinced that these guys could find fish in a rain filled pothole. Mike just called me yesterday to tell me about he and Tony finding a pile of legal sized redfish on a backcountry flat just north of Key West. 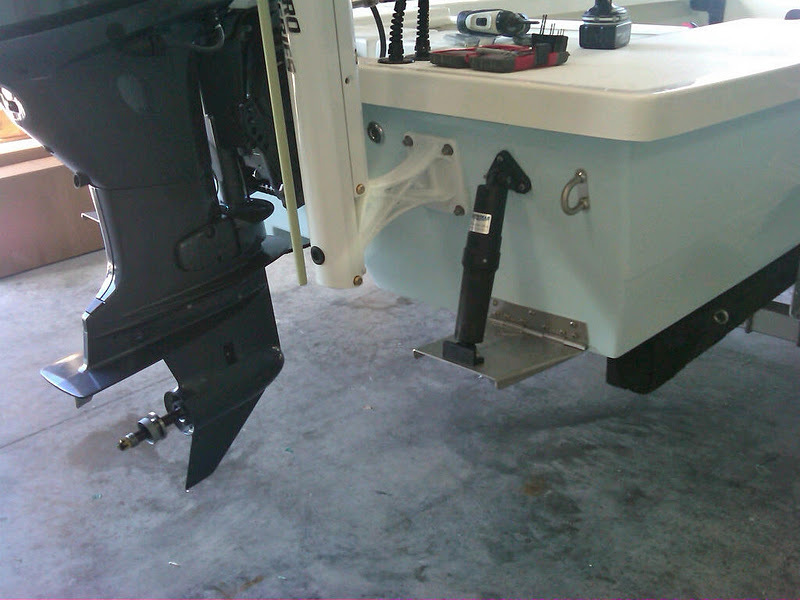 Boaters have a choice of two marine towing services here in SW Florida: Sea Tow and Tow Boat U.S. I've been a member of both over the years and have no complaints about either. When I was guiding in the Keys I was a Sea Tow member and had to use them on three occasions in ten years. Each time they responded quickly and got me back home with no hassles. Up here on Pine Island I've joined Tow Boat U.S. I switched to their service simply because they have a larger presence on the waters that I fish. 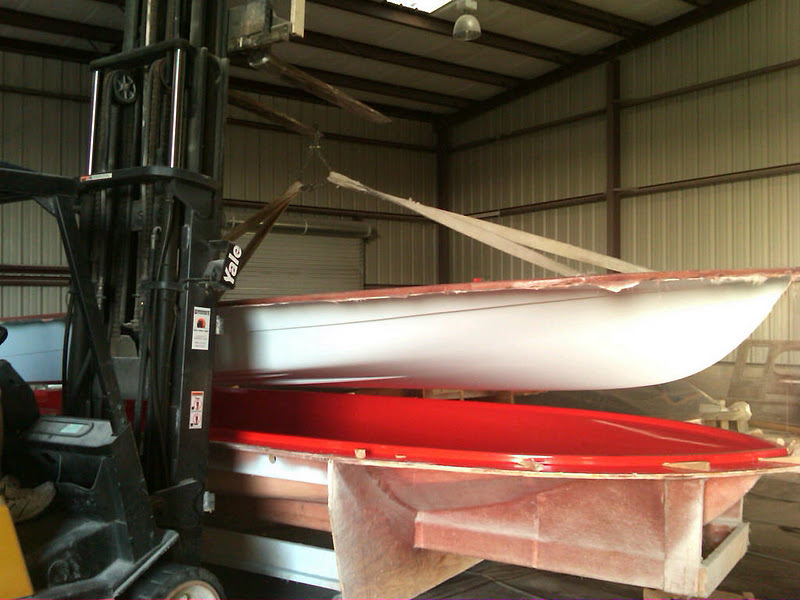 Two of their boats are based in Bokeelia and you can always see one standing by in Charlotte Harbor on the weekend. I haven't needed them yet but if I do I'm sure they'll be the fastest to respond around here. Both services have the same annual membership dues, around $150 a year, and this is a total bargain. If you're not a member and need towed then expect to pay a minimum of $250, no matter how close to the dock you are. The average towing cost is actually closer to $600. If you're an avid boater and don't have a towing policy you're really asking for it. Local angler Brandon Dye with a 21 inch redfish caught while kayak fishing off Matlacha. Fishing the negative low tides in Matlacha Pass and Pine Island Sound is one of my favorite things about the winter. When they happen in the first few hours after sunrise you'll find some of the best tailing redfish action anywhere in Florida. This weekend's full moon helped give us some remarkably low water and the tails were almost everywhere once the tide started flooding. 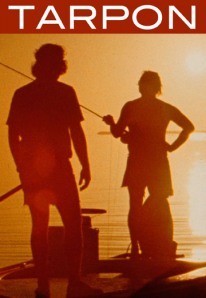 Director Guy de la Valdene’s “Tarpon” is by far the best movie ever made about saltwater fly fishing. It was shot in Key West in 1973 and perfectly captures the town and the fishing as it was back then. “Tarpon” follows a handful of guides and anglers, including the well known author Tom McGuane, as they chase these giant fish on the fly off Key West well before the rest of the world discovered the sport. It’s fascinating to see how much things have evolved since those days of thick fiberglass rods and flats boats with wood trim and without poling platforms. The sheer numbers of tarpon that these guys had all to themselves is jaw-dropping and the slow-motion footage in this movie has never been topped. While the fishing scenes are stunning, my favorite thing about the movie is how it serves as a time capsule for a Key West that sadly no longer exists. The island was my home for over a decade but I arrived too late to see it like this. Duval Street of the early 70’s was different planet from the cruise ship infested trinket zone that it was rapidly devolving into while I lived there. The Key West captured in this movie has been extinct for so long that it almost depresses me to see it captured here in its natural state. The real payoff when you watch “Tarpon” for the first time is its perfect portrayal of fly fishing as a sport that seriously respects the fish. In one single scene it drives that fact home far better than anything that’s ever been filmed before or since. I won’t give it away, but when that scene comes, without any dialog or narration, you’ll be stunned at the subtle brilliance of it. It is the movie's entire focus delivered in one quick jump of scenery. Shortly after it was filmed, “Tarpon” slipped into limbo. It was shown once or twice on TV and then went back into Valdene’s vault. Somehow, a primitive video tape was made and started getting passed around by a few anglers down in the Keys. 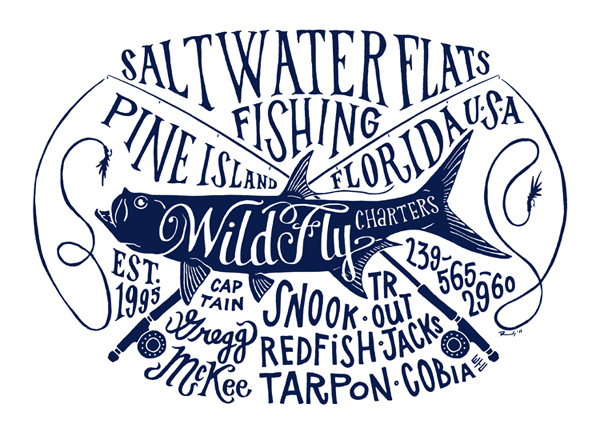 Over the last three decades it gained a cult following and we used to play a grainy, pirated copy all day long at the Saltwater Angler fly shop in Key West. We were really sad the day the shop's VCR finally ate our worn out tape. It was our only copy. I was thrilled when I heard from one of the folks involved with the '73 filming that a remastered version would be out on DVD. Seeing it for the first time in its original state makes Guy’s achievement even more brilliant than I ever realized. If you’re a tarpon fisherman, or are serious about any kind of fly fishing, owning this movie is a must. It is the “Citizen Kane” of fishing documentaries. If you’re a Buffett fan then you’ll also need a copy. Jimmy’s instrumental soundtrack covers the entire movie with a perfect atmosphere of the Key West that he knew in the 70‘s. Even if you don't fly fish but just appreciate great filmmaking, then pick up a copy, too. Unfortunately, it's not available on Netflix so you'll have to buy one. Click here and do that immediately so you'll have it in time for Christmas. For those of you who live on Pine Island or Matlacha and have visited Key West recently, do yourselves a favor and watch this movie. You'll feel incredibly fortunate for what we have right here and will want to hang on to it now more than ever. We're closer the Key West of this movie than anywhere else in the world. 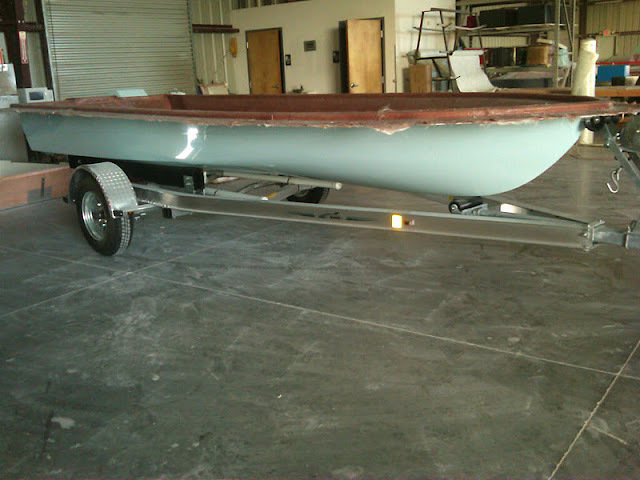 After spending more than a week with my new Beavertail, I've got some rough performance numbers for this skiff with its 70 Yamaha Four Stroke. My main goal for this boat was a cruising speed of 30 mph at no more than 4500 rpms. Top speed was not as important to me since the only time I run at full throttle is to escape a thunderstorm. With its current 4 blade Power Tech prop I'm getting 28 mph at 4500 rpms, just 2 mph shy of my target speed so I'm going to try a 3 blade next week. The fuel consumption of this Yamaha has been phenomenal at just under 3 gph. That's during an actual fishing trip that included jumping on and off plane at least a dozen times with two anglers and a full tank of gas. This is better than I expected and about the same as my older and lighter Beavertail B2 with its 2 stroke 50. This engine is a real winner. The draft is 7 1/2 inches and that was measured right after I took the photo above, again with two anglers, a full tank of gas, a loaded cooler, and a lot of fishing gear. I've also got this boat rigged with a 24v remote control Minn Kota trolling motor and a Power Pole so there's another 200 pounds. Skip those two options and you'll probably loose 1/2 of draft. That's only a one inch gain over a full loaded B2. Eight year old Trey Parsons was killed in a traffic accident at the intersection of Pine Island and Burnt Store Roads on October 15th. His father David, a local shrimp boat captain, was also in the car and survived but with serious injuries that have left him unable to work. Jim Frock who owns the Seven Seas Bait and Tackle shop on Matlacha is organizing the benefit which will be held at 5149 Pine Island Road this Saturday starting at 10:30AM and ending with a bonfire after dark. Several local bands will be playing all day and a you can eat a lot of great local seafood, too. Read more about it here. There will be a silent auction and I've donated a half day fishing charter so please go out there this Saturday and bid on it. It'll will be a good time and every dollar you spend will go right to the Parsons and their two children. This is a fantastic month to hit the flats around Pine Island and Matlacha, especially if sight casting to redfish is your game. With some great low tides and water that gets more clear every day, spotting these big orange slobs on the flats will be a lot easier than any other time of year. Check your tide charts and pick the days with negative lows happening early in the morning. That will give you the best possible tailing conditions for redfish, especially when the winds are calm. The massive flats to the north of the Pineland Marina are some of the best areas to fly fish for tailers and we'll have perfect tides for that on the weekends of the 9th and 23rd this month. The cold fronts are the only drawback to December and we've got another one bearing down on us as I write this. Fortunately, there is always some place to hide around here when the winds whip up and many of the backcountry creeks are filling with snook. Tuck inside and start casting white baitfish patterns like Norm's Crystal Schminnow at high tide and this is a sure way to get dozens of hits from smaller snook and the occasional monster. Trout fishing is still closed until January so I try avoid targeting them specifically. If you really just feel like bending a rod on a few, make sure you stick to single barbless hooks and release them quickly. Sea trout are the most fragile of our three inshore gamefish and there's no reason to needlessly kill one right now. Here's a shorter clip that I shot on the same day as my previous running video. This one shows the new BT3 running down sea and still not getting a drop of water on the camera lens. Here's a few minutes of video that I shot yesterday in Charlotte Harbor around 10:30AM. The wind was steady out of the NNE and blowing over a falling tide. There was the occasional small whitecap and generally a lot of confused chop. This is great example of just how dry the new BT3 is when running in open water. I've never experienced anything like it. We took the new Beavertail BT3 out for its first real test ride today off Pine Island and I'm even more impressed than ever. The Yamaha 70 still has less than two hours on it and is still in its break in period so I can't any real performance out of it yet. The boat got on plane at just over 2000 rpms and I hit 22 mph at 3000 rpms. This is with a full tank of gas, three adults, and 1 dog on board as well as all my fishing gear. After another hour of use I'll be able to go full throttle and find its top speed with the current prop. 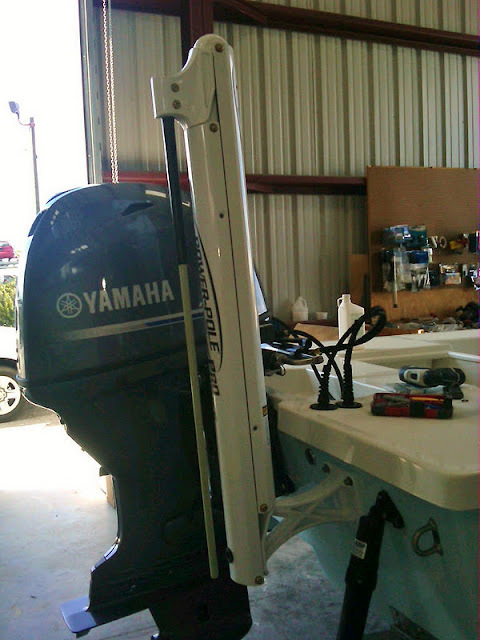 The BT3 poles like a dream and barely feels any heavier than my 2006 B2, which had a hull weight of only 550 pounds. My BT3 weighs about 100 pounds more and I'm also carrying a 24 volt trolling motor and its two extra batteries as well as a gas tank that's holds 23 gallons vs. 15 gallons in the B2. 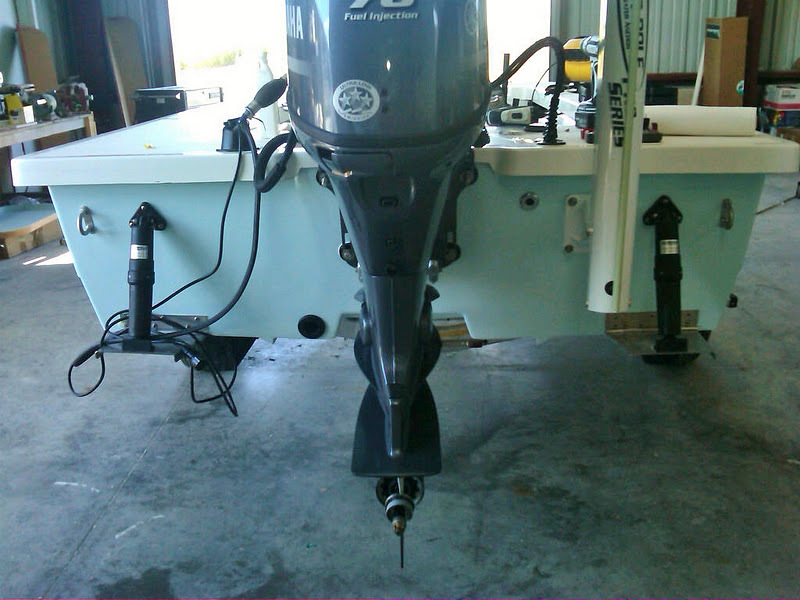 I've also got a 257 pound 4 stroke on the stern as opposed to my B2's 156 pound 2 stroke. So I probably gained an extra 400 pounds with this BT3 over my previous hull. I haven't measured the draft yet but I'm sure the new boat only draws an inch more than the B2, which is exactly what I expected. What really amazes me the most about this boat is how dry it runs. We left Matlacha at 10:30 this morning and ran up the pass into a 15 knot breeze blowing straight out of the north. With the tide falling there was a serious chop in Charlotte Harbor but I never got hit with a drop of water. No matter which way I turned the boat, I could not make the spray come over the bow. I've never experienced anything like it in any flats boat and I actually shot a quick video of it that I'll post here soon. The ride itself was a good deal smoother than the older B2 but it was still obvious that we were in a very light boat. My dad's Action Craft 1890 cuts through the chop a lot quicker but it will soak you in the process. 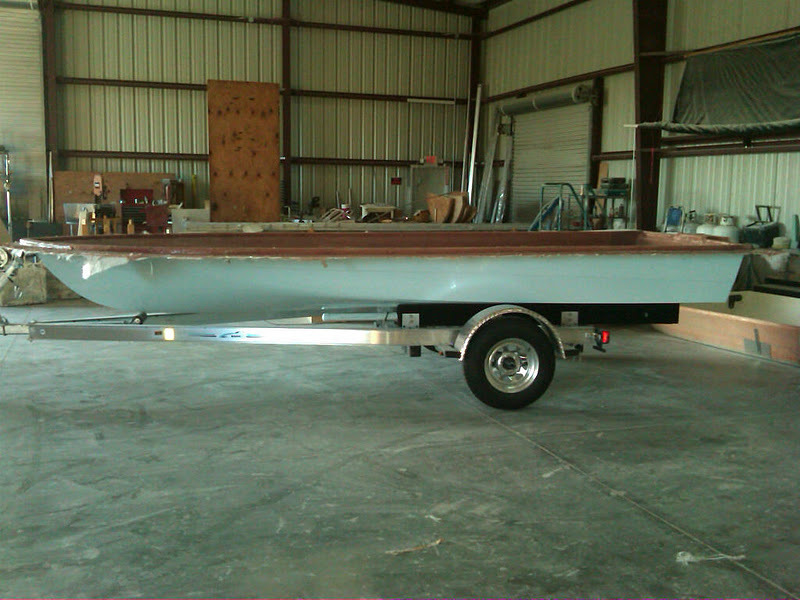 The BT3 is still a true poling skiff so running full throttle across a windy, open bay will be a rough ride but at least you'll be dry when you get back to the shallows. So on day one the boat has more than met my expectations. On the way back to the ramp I called the owners up at the Beavertail shop just to tell them how thrilled I was with their boat. They really hit a home run with this one.